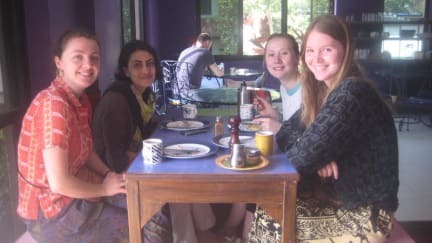 the Sparkling Turtle Backpackers Hostel i Katmandu, Nepal : Boka nu! 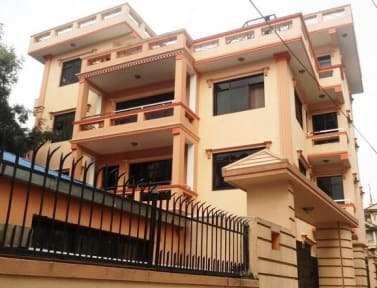 We are an independent Backpackers Hostel located in the heart of the sacred and mystical town of Swoyambhu (MONKEY TEMPLE) Kathmandu. The Sparkling Turtle Backpackers Hostel offers a unique opportunity to live among Holy Monkeys and to experience the vibrant chanting of the Monks prayers from the many monasteries that surround Swoyambhu. We offer clean, affordable and safe accommodations for all those who have come to explore the endless beauty that Nepal has to offer. You will find a friendly and comfortable atmosphere to connect with and share stories among other travelers. After a long day of sightseeing and traveling come and relax in our Chill out Turtle Cafe . We have an Nepali infused style European BBQ and a salad bar designed by our Chef, as we know that it can be challenging to consistently eat local foods. A definite refresher for those who are traveling long term through Nepal and India! Our Cafe includes locally grown Boutique Coffee, international and local selection of a wide variety of premium Teas, Wines and Beers. We can arrange for in-expensive airport pick up, please let us know 24 hours in advance with full name , flight number, airline name, time and date.